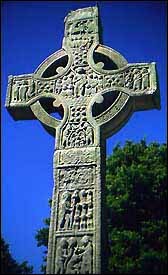 Scholars speculate that the Celtic Cross developed from the sun cross, solar cross, sun wheel, etc., a pre-Christian symbol found in northwest Europe and Scandanavia — a cross inside a circle, or a four-spoked wheel. When Christianity came to Ireland and Scotland, Christians extended the bottom spoke of this familiar symbol to remind them of the cross on which their new Savior was crucified. 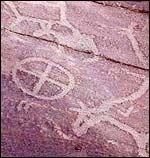 A pre-Christian symbol, the solar cross or sun-cross is found in neolithic rock carvings in France, Scandanavia, etc. An early sunwheel cross can be found at St. Dogmael's Abbey, Deyfed, west Wales (Pennick, The Celtic Cross, p. 25.). Christ Pantocrator, dome mosaic (1090-1100 AD) from the Church of Daphne in Athens, shows Christ with sun-cross halo. Ruthwell Cross (650 to 850 AD). The Cross is seventeen feet four inches tall and must sit in a well four feet deep to serve as the high cross for the church. "With the comparable cross at Bewcastle it is undoubtedly the most important sculptural survival from Anglo-Saxon Britain and arguably from early medieval Europe" (Cassidy 3). Wayside crosses are found at stopping places of missionaries, where they preached and prayed. Some of these were later marked as sacred places with crosses. Many ancient cross are found in Cornwall. St. Kew Cross, Cornwall. The cross was found in 1924 as part of a footbridge. It is now located in the churchyard at St. Kew church. St. Pillack's wheel-headed cross, 9th-10th century AD, in the churchyard. Crude figure on cross. St. Dennis churchyard cross, Cornwall. A number of ancient stone crosses and cross slabs have been found on the Isle of Man at Kirk Andreas, Kirk Ballaugh, Kirk Braddan, Kirk Lezayre, Kirk Lonan, Kirk Maughold, Kirk Michael, and Kirch Onchan. St. Martin's High Cross, Iona Close-up. Another. 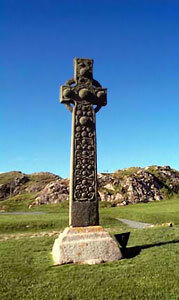 St. Martin's Cross, Iona Abbey, eighth century. Kildalton Cross, Kilmorie, Knapdale, Strathclyde. Ninth-century. The Monasterboice Tall (or West) Cross is made of sandstone, at 6.45 m. high, it is the tallest High Cross in Ireland. It is dated in the 10th century. This view shows the east side with the Last Judgment. This is the cross used for the Joyful Heart Renewal Ministries logo. More information. Monastery Clonmacnois, in central Ireland. Muiredach's Cross, Ireland. Another. Several other views. Erected in memory of Muiredach, Abbot of Monasterboice (d. 922 AD). Muiredach Cross (900-923 AD), east side, Monasterboice, County Louth, 16' high, is considered the finest cross in Ireland. West side. Clint Albertson, SJ, High Crosses of Ancient Ireland. Site rich with pictures. Viking Cross, wheel-head Gosforth (Cumbria). Tall 4.5 metre cross, 940 AD. Cut down in 1789 to make a sundial base. Now restored. A khatchkar (stone cross) in the churchyard at Hairavank Monastery (western shore of Lake Sevan). Aberlemno church Pictish Cross slab Another. Another. Another. Peace Cross, St. Albans Preparatory School, Washington DC. Close-up. Here's an excellent book on stone crosses. Order now. The Megalithic Portal, photos and information on many ancient artifacts. Links to several celtic crosses. Copyright of artwork. Much, but not all, of the artwork linked to on this site is in the public domain worldwide due to the date of death of its author (if it is was published outside of the U.S. and the author has been dead for over 70 years), or due to its date of publication (if it was first made public in the U.S. before 1923), at least in the United States (see Bridgeman Art Library v. Corel Corp.), in Germany, and in many other countries.